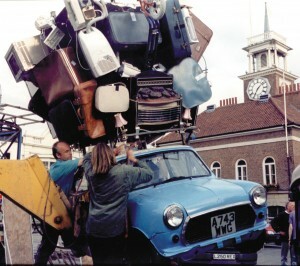 Co-designed with Tim Hunkin and David Clough Commissioned by Stockton Festival in 1995. A festival finale where the Lord Mayor of Stockton on Tees lights a blue touch paper and a 150 yard pyrotechnic fuse burns down the high street. As it passes each street light a domestic appliance is exploded. The fuse finally reaches the main square and the waiting structure, a 50′ horizontal wheel, with TV sets at the perimeter. With a loaded down mini car at the hub the wheel slowly starts to rotate. The TV arms rise up, the roof rack contents explode and as the TV’s burn and crash to the ground a flock of wind up doves are released from the top of the structure along with many more pyrotechnics and the cheers from the crowd.